Be the first to share your favorite memory, photo or story of Mrs. Debra Lynn. This memorial page is dedicated for family, friends and future generations to celebrate the life of their loved one. 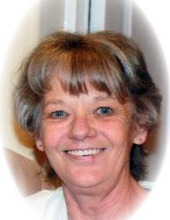 Mrs. Debra Lynn Fox, age 63, of Temple, Georgia (Haralson County) passed away on Friday, April 5, 2019 at Tanner Medical Center (Carrollton, Georgia). Mrs. Fox was born on July 8, 1955 to John L. Thomas and Gladys Marie "Bonnie" (Mosley) Thomas. Prior to her passing, she worked in the Nutrition Dept. at Kroger. She was preceded in death by her parents, John L. (Gladys Marie " Bonnie" Mosley) Thomas; her aunts, Ruby Couch and Opal McAdams and her uncle, Jerry Mosley. Debra is survived by her husband, Richard Fox; her son, Joey (Melinda) Mauldin; her grandchildren, Ryan Mauldin and Owen Mauldin and her brother, Steve Thomas. Funeral Services for Mrs. Fox will be held on Wednesday, April 10, 2019 1:00PM at Benson Funeral Home with Rev. Roger Murdock officiating. Mrs. Sandra Floyd will be providing the eulogy. Interment will follow at Corinth Baptist Church. The family will be receiving friends on Tuesday, April 9, 2019 from 4:00PM - 8:00PM and Wednesday, April 10, 2019 from 11:00AM - 1:00PM. All visitations will be held at Benson Funeral Home. To send flowers or a remembrance gift to the family of Mrs. Debra Lynn Fox, please visit our Tribute Store. "Email Address" would like to share the life celebration of Mrs. Debra Lynn Fox. Click on the "link" to go to share a favorite memory or leave a condolence message for the family.